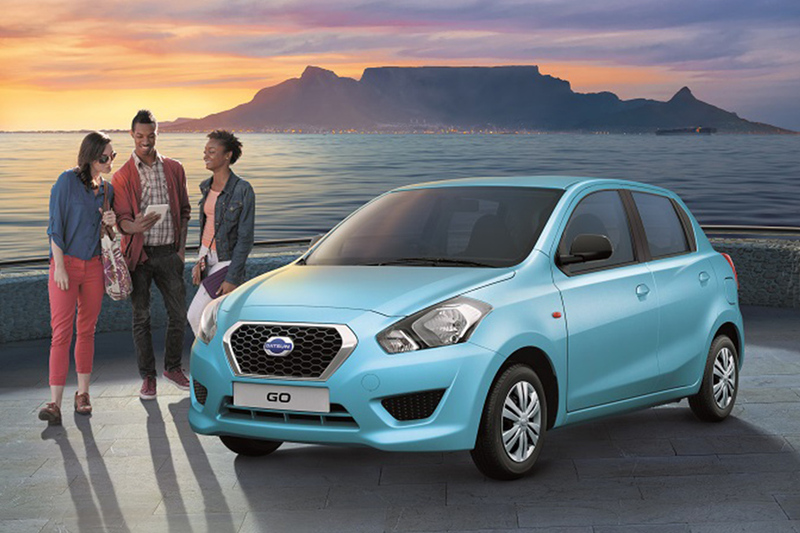 2014 saw the return of Datsun to our shores with the introduction of the erstwhile brand’s first modern product, the Go. This funky hot hatch is available in two specifications (Mid and Lux) with one engine and transmission (1.2-litre petrol, five-speed manual). It is 1.6m wide, 1.4m tall and 3.7m long with a long wheelbase of 2.4m. With the entry-level unit priced at R89 500 and the most expensive at R99 500, this car will appeal to the younger or budget-conscious buyer in need of a no-frills runabout. Good enough for cash-strapped South Africans in need of transport in light of our unreliable public commuter system and high fuel costs. The Datsun Go is a good looking and stylish little vehicle. Our test car, in a funky blue colour, blends in nicely with other cars of similar size in the market. 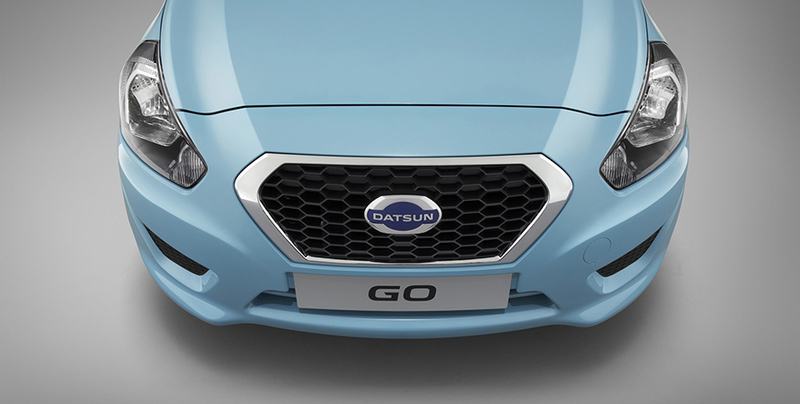 Datsun’s market research into its buyers' need for good looks rewarded the brand handsomely as it rendered a car with a new contemporary design complete with large hexagonal grille, black honeycomb mesh with chromed surround. However, the Go seems to have borrowed the front grille from Ford/Volvo, a body from a Nissan Micra and a rear that bears an uncanny resemblance to a Toyota Etios. But the overall look works! As a budget car, the interior is functional and quite plasticky, although thankfully without the annoying squeaks. The front seat is a retro affair with a front bench and no centre island that most cars have, but allows you to slide in comfortable from any side that a door is able to open. Also quite handy for students if you need to cram extra friends in front! I kind of liked the retro handbrake positioned in the centre console and the high gear lever. I absolutely disliked the manual external mirrors which I had to adjust in the rain by opening the window. 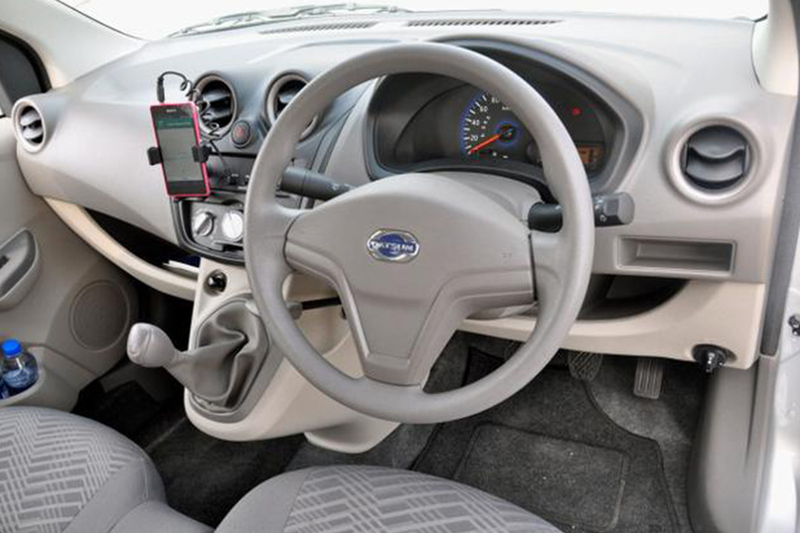 Datsun has catered to its "20-something" or tech savvy market by providing the basics for a smartphone lifestyle. The test car was fitted with a phone docking station that requires an auxiliary connection to use the built-in speakers. The USB jack is only there for charging the smartphone. A bit of a downer as it means you have to have music or radio from your phone or iPod instead of the normal radio. There is, however, surprisingly enough head and legroom for such a small car. The boot space is also a decent 295 litres. It will get you from point A to B in relative comfort unless fully laden and there are no hills in sight. The Go is powered by a 50kW/104Nm 1.2 petrol engine mated to a five-speed manual and fuel consumption is a decent 5.2 litres/100km. The engine is surprisingly brisk although the gear changes are a bit notchy and difficult to slot, with no insulation against engine and road noise. The car has an annoying vibration while idling but the take-off is smooth. This is however no boy racer and delivers enjoyable driving once you have learned to work with the car’s capabilities. It has no ABS or airbags, not even as an option. It is therefore a decidedly low-income and basic means of commute. The Datsun Go performs adequately but will appeal to a relatively young market. It will transport you in comfort, tick many elementary boxes for a budget car but be careful not to load too many passengers or luggage. It's designed for city driving and, on that score, it delivers handsomely!